June 24, 2001 — Enlisted men's barracks at Fort Tejon. Fort Tejon is located at the top of the Grapevine Pass in Grapevine Canyon (Cañada de las Uvas) on the Rancho Castec. It was garrisoned by the United States Army on Aug. 10, 1854, in order to control Native Americans on the 75,000-acre Sebastian (aka Tejon) Indian Reservation — which Edward F. "Ned" Beale, then Superintendent of Indian Affairs for California and Nevada, was setting up 17 miles northeast on the original Rancho El Tejon — and to guard against raiding parties from other tribes. The first military fort in California's interior, Fort Tejon was abandoned in just 10 years, on September 11, 1864, as a cost-cutting measure by the U.S. Army, which needed to save money to fight the South. 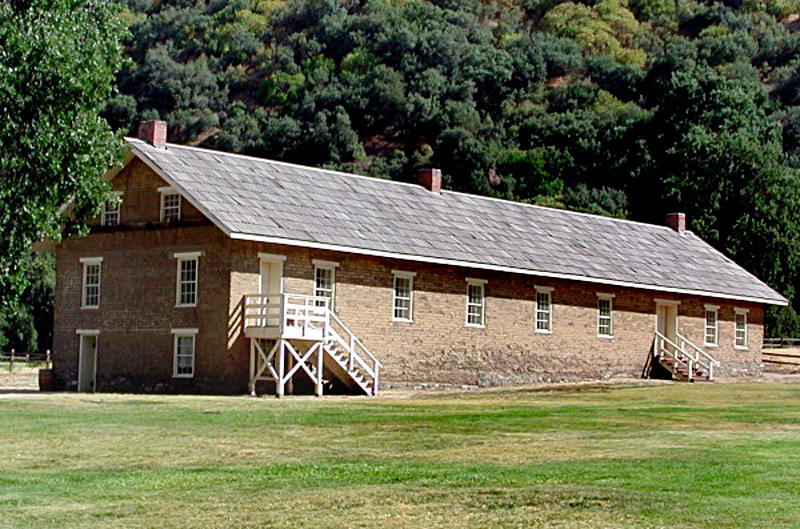 Structures at Fort Tejon were arranged in a quadrangle around the parade grounds and were constructed at various times throughout the army's occupation of the fort. Some, including the enlisted men's barracks, were destroyed and rebuilt after a major earthquake, epicentered at the fort, struck at 8:13 a.m. on Jan. 9, 1857. Many more were lost and never rebuilt after an earthquake a century later, in 1957. LW2129b: 19200 dpi jpeg from 600 dpi jpeg from digital image by Leon Worden.